Memory Lane: Comedy skit television still has it! Watching old television shows is like walking back into one’s past. Once you walk into the quantum leap of your past, you start to shed some tears during your “the wonder years,” but what it comes to play twenty, thirty or forty years later into your future – those tears bring back the memories of classic television, we don’t often see in today’s prime time television line-up’s. I couldn’t help the fact that my daily dose of medicine and laughter literally caught up with the show’s that were once shown on prime time television in the 1970’s and 80’s. I remember watching on Tuesday nights with my folks “Barney Miller,” “Happy Days,” “Laverne and Shirley” and who could forget the “Bob Newhart Show” with Bob Newhart himself. 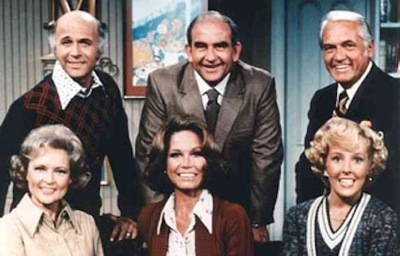 Cast of Mary Tyler Moore Show, 1970-1977. A friend of mine from my high school days, recently confessed under the oath of Facebook tyranny, that he didn’t realize it until now – that every character on the “Mary Tyler Moore Show,” used their real first names! It’s true, Actress Mary Tyler Moore was Mary Richardson, Gavin MacLeod played Murray Slaughter, a hardworking network news writer, Edward Asner played Lou Grant the overworked News Director, Ted Knight played Weatherman Ted Baxter, Valerie Harper played Rhoda Morganstern, Georgia Engel played Georgette Franklin, Bette White played Cooking extraordinaire, Sue Ann Niven and Cloris Leachman played the ever minded Phyllis Lindstorm all had recurring roles as the show ran from 1970-1977. Moore, Asner, and Knight used their real first names in the show, as the show grew into popularity with fans through its seven season run. Popular at its time, childhood memories still find me watching this show from time to time and the bigamy of comedy the show’s producers provided each week on network television. As we grow into the twenty-first century of television, such classics as the Mary Tyler Moore Show, will forever be the classic of American Comedy shows involving the premise of a single women making it on her own as a feisty television news producer. The show was cancelled in 1977 by CBS, but the laughs and the memories of watching classic television can be seen in reruns on the MeTV Network. The Mary Tyler Moore Show wasn’t just one of my all time favorite comedy classics, it grew with the likes of M*A*S*H, Emergency!, Adam-12, Ironside, Hawaii Five-O and many, many more that have brought on some of the greatest memories television comedies of the 1970’s and 80’s. The calamari of prime time television has changed through the years, it didn’t stop me from having such favorites and childhood memories with friends who came over each and every Saturday night to watch such television favorites as Emergency!, Adam-12, The Six Million Dollar Man, Hogan’s Hero’s and more. Comedy writing during the 1970’s was probably at it’s best by today’s standards, but likely hard to come by if it were written nearly forty-years later into the future of the twenty-first century. Even more brilliant than comedy of sitcom’s from 1950-1959 were some of the most brilliant writing and comedy skits ever produced in the history of television. To name a few prized comedies of the 1950’s, some were never known to those in this generation and some were known since the birth of comedy skits of the ’50’s, “I love Lucy!” made Lucille Ball instant star on CBS, “Bonanza” which starred the late Micheal Landon as young Joe Cartwright on NBC, the “Jack Benny Show” on CBS made Benny a household name by the end of the decade, “Ed Sullivan” became an instant hit, when he hosted the British famed rock group “The Beatles,” to the United States for an appearance on his show on CBS in 1964. Television couldn’t be any better than this, but the memories of classic television viewing proves once again, that television can be fun and amusing as reruns from old-time favorites and more even in generations or decades later – One could rant on and on, that Barney Miller and Welcome Back Kotter and Taxi were in the prime decades later as classic comedy’s. And that’s a wrap – down memory land. Ok folks, those of you that live in the Eugene-Springfield area that are looking to support good cause? A great cause? How about enjoying a pulling up a pint for a good cause? Join the cast and crew of Rick Dancer TV and the folks of the Eugene Hearing and Speech Center for an all day fundraising event for the Eugene Hearing and Speech Center? Where and when? Well, the Oakshire Brewing Company will be donating a $1 for every pint sold on Wednesday, January 14th, 2015 at their tap house in Downtown Eugene at 207 Madison Street from 11AM – 10PM to show their support and admiring gesture of support to the Eugene Hearing and Speech Center’s Mission and their cause of helping folks with Hearing Loss, Speech therapy and more – It all starts with showing your support for EHSC and Oakshire Brewing on January 14th. Be sure to check out the YouTube video at the end of this post about the event on January 14th. For many years, I’ve had nothing but good vibes and experiences with the EHSC through the years, since losing my own hearing at the ages of three and four prospectively since the late 1960’s. It wasn’t until the early late 1990’s and 2000’s that my hearing started to decline once again. In 2005-’06, I made a major jump from one bandwagon to another and certainly had it’s merits of going “bionically,” as some folks in my generation would recall in the 1970’s, two television shows that made technological advances into the world of television, actually made it’s way into modern day lifestyles of prosthetic’s and the advancement of one’s hearing into the world of Cochlear Implants. Eugene Hearing and Speech Center was responsible for the decision making process that took place back 2005-2007 years – the decision was rough, but it paid off handsomely eight years later, when I finally upgrade to the next generation process of my Cochlear Implant journey – the Nucleus 6. In the fall of 2006, I was granted permission by my medical insurance to allow me to get an expensive and much needed Cochlear Implant surgery, that would help restore my hearing to the lengths and strengths, I had not seen or heard since, the late 1960’s when I lost my hearing in the years of 1968-’69. The flourishing of technology and the advancement was far greater than I had ever experienced with my hearing in the waning days leading up to my Cochlear Implant surgery in 2007. On February 7th of that very same year, my world changed, entirely. My life not changed, so did that of my Mother, who was with me at the time of my activation, our lives have never been tabbed to a more magical moment in more than thirty-nine years at the time of the day of infamy. When I heard her first natural words, “Jeffery can you hear me,” has she said, while sitting across from me at the time – it was the first time in memory, I had ever seen my mother cry a river of joy, since losing my hearing in 1968. My life would’ve been doomed from the start, if the implant didn’t work – but, it did happen in way, a way I had dreamed many times before that infamous day in 2007 – naturally, it was the happiest time of my life. Things have changed enormously, since day one! Seriously, the naysayers whom are against having a Cochlear Implant have no understanding how my life has changed in those eight years – eight years to be exact. The infamous scare, that technology will never be the same or will ruin their lives with a bad decision from the’ll regret from the start. It actually gave me the confidence and an enormous technological advancement in my quest and mission to hear and to that of my family and friends to see that our lives have been effected by the change of events to an elegant price – it all paid off handsomely! Since the death of my grandfather, it was his dream to see me hear and for me to hear the world, he wanted the best of the best – the “Top Guns” of hearing! He passed away in early 1990 without ever seeing that dream. But, in my heart, I know he has because every time I tell that story, the tears swell up in my eyes and his shadow leans over my shoulder knowing that he has seen the transformation from a far has heaven can see with us here. At least my Grandmother was able to see the merits and the benefits of hearing before she passed away in 2010, just three days shy of Christmas – she witnessed the dream of that my grandfather once had during his lifetime on earth. But, it stop me from venturing my quest to hear the world as I do today – there are still times when I discover sounds I’ve not heard in many years or ages or even decades as I once heard them with my natural hearing alone. It was the closet gift from heaven – one that spared me the anguish, but one that gave me the gift of happiness ever after. Has I said before, I couldn’t have been more happier with the way the folks at the EHSC have provided me with service and helpful insights for more than forty years of my life – a $1 a pint for a cause that Oakshire will donate for each pint sold on January 14th 11am to 10pm is worth the cause and the gift of hearing and for those who seek to share their own stories of their own journey’s. This story is a stark reminder, there is always something for those who could benefit from the services and more of the Eugene Hearing and Speech Center. I know I did just that through out the forty-plus years of my life. So, come out and join the cast and crew of Rick Dancer TV and the folks of EHSC help you help a cause, not that I believe in, but that we all believe in! I know it’s well worth the time and the efforts of those who work with the EHSC for every pint sold during the fundraising event, that $1 donation goes a long way in helping those who use the services of EHSC and a whole lot more. Midlife crisis at 49 – Maybe? Every day and night, when I sit at my desk, I stare are my computer screen trying to think of a written blog piece to pen on my for my readers. I once said, “that my blog was my own column,” – it realistically seems that way in reality. In my own mind, its not that simple to the things in life that seems impossible to write about? Literally, it’s life itself – something that brings the story to life, but it’s not always the course, a Writer’s life is mirrored with his or her own life in middle, a life crisis of sorts to say. When I was in college, six years after graduating from high school, I had dreams of writing or reporting as a career in journalism, two years under my belt and tons of published pieces from my college rag – friends and classmates gave the high fives and the rave reviews of a job well done on each week’s published piece. With only 12 blog written this year alone, my time at the computer seems to have been wasted on an empty meter. As search for the perfect piece to write and publish, life’s hacks must must take a backseat and clear the wind has your mind drives down the super highway looking for brag to write, pen and publish – it’s neither simple or easy, it’s all in a days work at the office, each and every day. As I near my middle ages of life with one year shy of reaching my half century mark – I often wonder, if I’d ever see that book tour or book adaption to screen or one’s own original television series written for all to read and see as the story comes to life in a range of mediums. Somewhere in my middle ages of life, I feel the meter life is spiraling out of control to a mid-life crisis? As I come to think of it, “ABC TV’s” Richard Castle is about to marry the love of his life, Kate Beckett – but the plot tickin’s until the Fall television season when fan’s of the most talked about television show on television find out, if their hero Richard Castle survived the threat’s of life before waltzing down the alter with Detective Kate Beckett in his arms as the Season Finale left a surprising cliffhanger in the lurks of fans wonder who was behind crop of events against Castle. If your a fan of the show – you’re likely a true die hard fan of television and Richard Castle and Kate Beckett. In my own mind as a writer, I seriously think Rick’s escape was a twist of fate has his clainstine father played by James Brolin is never far from his Son. Remember this hasn’t been written in concrete, I’m just guessing a scenario that could possibly crop into the script for next season – ultimately, writers like to think like writers – how clanstine is that, even though your not one of them writing the script – but, you think like one! But, what does this have to do with Richard Castle and Kate Beckett? Nothing, just a tad comparison between the likes of Jason Bourne and the late novelist, Tom Clancy’s Jack Ryan in place of my so-called wreckage of a mid-life crisis. Truly enough it seems writing life is a mid-life crisis of it’s own, my own life is just a tad shy of being fifty – Maybe, I’m watching to much of Rick Dancer TV? Perhaps, Rick and Emma could be some help? Even though, Rick is known to “kill” his enemy on camera who thought he was “dead” from television making after years in the news business as an anchor and reporter.